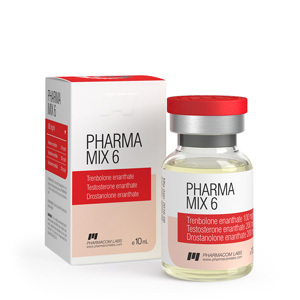 Pharma mix 6 is a combination of three long esters of potent steroid substances (trenbolone enanthate, testosterone enanthate, drostanolone enanthate). Such a combination of three steroids of enanthate ester allows to enhance the anabolic properties of each individual component of the drug, providing a stable, long-lasting effect after administration. Pharma Mix-6 is produced by a Moldovan pharmaceutical company relatively recently, but has already earned great popularity among experienced bodybuilders and novice strength sports. Steroid is used to grow muscles, increase endurance, strength of the athlete. The drug is available as an injection solution, in one ampoule contains 1 ml of the drug with 500 mg of the active substance. The steroid has a strong anabolic and androgenic effect on the athlete’s body. The drug is active for 14-16 days after the injection. Pharmacom mix 6 has a slight tendency to aromatization, but does not provoke fluid retention in muscle tissue, which eliminates the phenomenon of recoil. The main effect of the steroid is to grow muscle mass, for a course of up to 10 weeks you can gain up to 9 kg of weight. regenerative processes are accelerated, the athlete needs less time to recover from exercise. Pharma mix 6 injections are recommended for a 2-month course. The drug is shown to experienced athletes, often undergoing courses of steroid drugs. Weekly dosage is 1000-1500 mg of the active substance (2-3 ml of solution). Injections need to be done with equal frequency to avoid adverse reactions. Beginners can start with a weekly dosage of 1 ml – ampoule. Many athletes may complain of painful pricks, the best place for injections is the gluteal muscles. For injections it is recommended to take a syringe for 5 cubes. To avoid the occurrence of adverse reactions, for the prevention of gynecomastia in the third week of injection, it is worth adding anestrozole and letrozole. Post-course therapy should be carried out several days after the final injection. For PCT, you can use clomid or tamoxifen for a month.